ABOUT THIS INTERVIEW: In an article entitled 'Beatles Talk,' Fredrick James let his tape recorder roll, capturing the fun between Paul McCartney and Ringo Starr. The text of the following conversation was then published in the March 1965 issue of The Beatles Book Monthly. 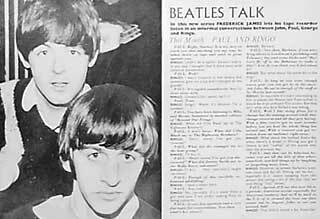 First published in 1963 and continuing throughout their career and beyond, The Beatles Book Monthly was the official fanzine of the group. It took full advantage of having access to amazing rare photos, it featured exclusive articles, and contained insights not found anywhere else. Sometimes also listed as Beatles Monthly Book, previously-owned copies of these excellent magazines continue to circulate in collector's circles, including online sites such as Ebay. While this UK-based fanzine had a rebirth in the late 70's and 80's, the most intriguing issues come from the years when the band was together. Article © 1965 Beat Publications LTD.
PAUL: "Right, Starkey! It is my duty to warn you that anything you say may be taken down on tape and used in print against you." RINGO: "I didn't do it, ossifer, honest I didn't. In any case I thought they'd done away with corporal punishment." RINGO: "I was a corporal in the cavalry but someone gave me tip and I changed to the guards." PAUL: "It's capital punishment they've done away with." RINGO: "London is the capital, isn't it?" RINGO: (sings) "Maybe it's because I'm a Londoner..."
PAUL: "You've been listening to Mike and Bernie Summer's in another edition of 'Beyond Our Fringe.'" RINGO: "What did Cilla Black say to The Righteous Brothers?" RINGO: "Don't move, I've got you covered." PAUL: "Enough of this carefully rehearsed ad-libbing!" RINGO: "I have a letter here." RINGO: "No, seriously. It's a letter from a girl who asks if we prefer making films to doing concerts." PAUL: "Now then, Barbara... If you were lying about in London on a pershing cold February day and some bloke said 'Hey, let's fly off to the Bahamas to make a film,' how do you think you'd feel about it?" RINGO: "What about the snow bit in the alps?" PAUL: "As long as you wear enough gear you can get by in the snow. Ask John. He sat in enough of the stuff at St. Moritz!" RINGO: "So naturally it's more interesting to film in places like Nassau and Austria than it would be in an ordinary film studio. But that isn't what this bird Barbara was asking." PAUL: "Well I like doing films for a change but the waiting around while they change cameras and all that gets boring. With a film you've got to wait months before you see how the whole thing has turned out. With a concert you get reaction from an audience right away." RINGO: "What about the rushes? Every day when there's a break in filming you get a chance to see 'rushes' of the scenes they shot the previous day." PAUL: "And all that can be hilarious because you see all the bits of film where somebody mucked things up by laughing or forgetting some lines." RINGO: "To answer Barbara's question once and for all, filming can be fun... especially if it means escaping from the winter and seeing a bit of the sun. But we love doing 'live' shows." PAUL: (American accent) "And we'll be back in the U.S. of A. around the time our film comes out in August, folks. So see you around, huh!" RINGO: "That didn't sound a bit American." PAUL: "Well, nobody'll ever know that when they read it in the Book, will they?" RINGO: "Go on, then. Talk about the film in an American accent." PAUL: "OK. It'll be finished by the middle of May and it will be made in colour." RINGO: "There you are. I told you they'd be able to tell." PAUL: "How do you mean?" RINGO: "I distinctly heard you say c-o-l-o-u-r instead of c-o-l-o-r. (to the tape recorder) Fred Tape heard it. Didn't you, Fred." PAUL: "And now folks, Ringo has gone into this fabulous dance routine. I just wish you could see him here. His foot-work is fantastic as he moves lightly 'round the room, kicking the tape recorder elegantly as he goes by. Wow, that is really something. Now he's doing the whole routine again with an American accent just for the benefit of all those readers across the Atlantic." RINGO: "Whew, I'm exhausted. You try doing The Monkey into a tape recorder mike in two different languages." PAUL: "No thanks. I'm trying to give them up." RINGO: "For an encore, let's play back this tape and mime to the conversation."